How does a DC treadmill motor work? How to avoid treadmill problems? reduce the coefficient of friction between the belt and deck as much as possible, replacing the belt at regular intervals. How does the DC treadmill motor work? It is important to have knowledge of the basics so you can understand why it is important to test the treadmill motor properly. The following applies to most domestic treadmills and some commercial treadmill motors. It does not apply to AC motors, which are mostly used in new commercial treadmills (treadmills for fitness centers and wellness centers). The shaft connects the motor to the running belt of the treadmill via a drive pulley and a transmission belt. The motor provides energy to start the treadmill when you press the start button. But how does the motor convert electrical energy into motion? Mounted on the shaft inside the engine there is a core of iron (rotor) and around it there is a wrap of copper wires known as windings or coil. An electric current is passed through the windings of the motor. The current comes from a motor control board that is connected to the motor via two brushes. The engine controller's job is to change the AC (alternating, usually 220/240) voltage into the DC and adjust the voltage. The motor would not work (indeed it would be damaged) if it was directly connected to the wall outlet. The motor control card also allows you to change the motor speed by adjusting the voltage to the motor according to the speed set on the treadmill console. When the electric current passes through the windings inside the magnetic field (created by permanent magnets), the shaft rotates to bring the magnetic balance back to the engine rotation. The rotational power of the motor depends on the force of the magnetic field created by the permanent magnets and the amount of current which travels through the copper windings. Therefore, the bigger the diameter of the motor is the better it is. Because the magnetic field of the permanent magnets is greater and the power at the same current is greater. In the motor, it is important to couple the concept as it is necessary to make sure that you have a sufficient torque so that the treadmill moves smoothly when you are on it. The motor torque is normally indicated in Watt or Horse Power (HP). You can increase the torque by increasing the magnetic field of permanent magnets (i.e. 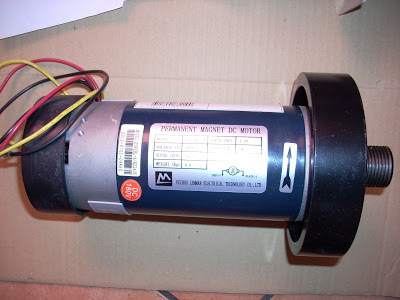 using a larger motor) or by increasing the current flowing through the windings. In practice, it is not possible to increase the magnetism of permanent magnets (they are permanent and cannot be changed). So you need to increase the current through windings to get more torque. The amount of current that can pass through copper wires is limited by the size of the wires and the capacity of the motor control board (MCB) that provides electrical current. If you try to pass too much current you can burn copper windings, which will cause them to blend, or overburden, destroying them.